Nick DiPatri's friends joke that his banana plant can probably be seen from outer space, but he settles for calling it his "piece de resistance." "It's super huge, the most coolest thing ever," the Manayunk software engineer says of his Musa basjoo, or Japanese fiber banana, which shot up from 2 to 20 feet in just two seasons. Like prehistoric green propellers, its 6-foot-long, 2-foot-wide leaves give DiPatri shade and privacy, and tickle his tropical fancy. "You do have to keep an eye on it," he says mischievously. "It grows about an inch a day." For many gardeners, the big surprise may be that it grows here at all. In summer, it towers over the 10-foot-by-12-foot yard behind DiPatri's hillside rowhouse. In winter, when it dies back, he insulates it with leaf mulch. But he can't wait for spring, to watch it rocket up once more. That's the fun of tropical or subtropical plants, or tropical-looking plants, or what are called "tender perennials." Their leaves zig and zag, their colors cause a riot, and their geometry is loud and outsized. Some work great as summer annuals or in pots on the patio. They freeze as the seasons change, so if you want to enjoy them the next year, bring them indoors or make like a squirrel: Dig them up and stash them away. It's called overwintering, and Roxborough garden designer Vicki Fox, of Green Team Gardeners, insists that doing the squirrel bit is no big deal. "Just put them in a dry, not freezing basement with a bit of peat moss and retrieve them in the spring," she says. Cannas and caladiums overwinter well, along with red dracaena and elephant ear or colocasia. But some tropicals - like Musa basjoo - are winter hardy, meaning they can tolerate the cold this far north, especially if they're in a protected spot or covered in winter. That makes Joe Kiefer's heart go pit-a-pat. "They're bold and exciting and sort of young and fun. For me, they're a joy," says Kiefer, a hardy-tropicals expert and co-owner with his parents of Triple Oaks Nursery and Herb Garden in Franklinville. He first became enamored of palms, then bananas. Now, with nurseries expanding their tropical inventory and every plant imaginable available online, Kiefer says, "It's really hip to be growing these plants. They're very trendy." The late 19th century was similarly exciting, as plant explorers from the West traveled the world to bring odd or "exotic" plants back home, says Joe Le Vert of Augusta, Ga., and the Southeastern Palm Society, a group for tropical-plant enthusiasts. These days, along with more plant variety and supply, Le Vert sees greater openness to different styles of gardening. American landscaping ideas used to come almost exclusively from Europe, where temperate gardens were all about natural landscapes and border beds. Now, he says, "we're looking at things and figuring out, 'Hey, we've got some stuff besides magnolias and American elms, and these things are really wonderful and usable.' "
Hardy-tropical possibilities for this region, besides DiPatri's banana, include the dwarf palmetto (Sabal minor), which has a fan shape and a down-growing trunk; the needle or porcupine palm (Rhapidophyllum hystrix); and the windmill palm (Trachycarpus fortunei). They're tough, good to about minus 10 degrees. Other options: hardy ginger, pineapple lily, and certain camellia hybrids. DiPatri learned about tropicals from Kiefer, a high school buddy, who also gave him his Musa basjoo, the hardiest of bananas. Interesting to look at, too. "These long stalks go up and back down," DiPatri says, "kind of like when you're in the sink, like the spray nozzle that hangs down." The flowers are yellowish and purple, sort of artichoke-like, beautifully complex. But the fruits are a bust, less than two inches long. DiPatri calls them "banana thingies," more culinary curiosity than anything you'd like to eat. "You're not going to bake banana bread with this," he says. For tropical-plant fans, however, fruit isn't the point. You might have been seduced by the lavish flora you saw on vacation in Florida or Costa Rica or Thailand. Maybe you marveled at the cannas and yuccas at Chanticleer last summer or the helicopter-sized palms inside Longwood Gardens' Conservatory this winter. "Just the idea of being able to have these things in your yard," Le Vert says, "is just really fun." 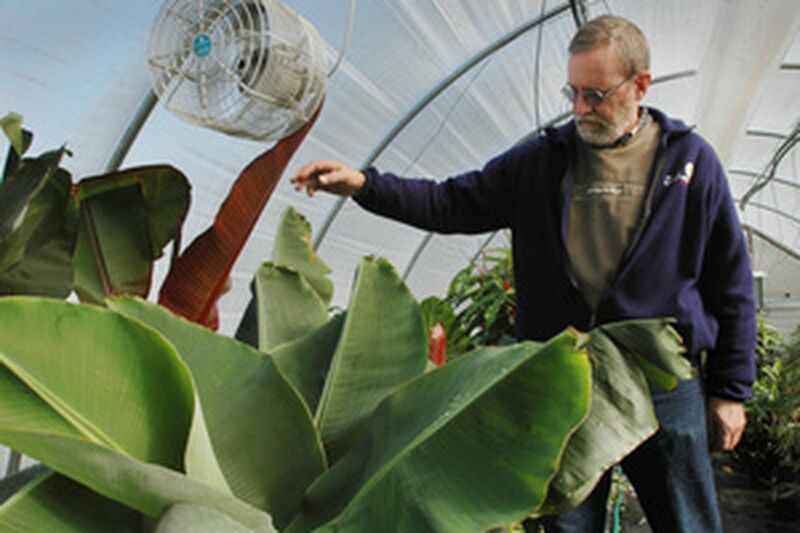 For other fans of tropicals, "it's the challenge," says John W. Story, general manager of the gardens and nursery at Meadowbrook Farm in Abington Township. "You're not supposed to be able to grow these things here." Story has a little help from 12 Quonset-style hoop houses, light prefab structures that are wrapped in thick plastic. The covering keeps the plants warm in winter and can be rolled up in summer. "Pretty low-tech as winter accommodations go," he says. But it does the job for Story's heat-loving beauties, among them frangipani (Plumeria), famous as the Hawaiian lei flower; a toothy African honey bush (Melianthus major); and the sweetest-smelling gardenia you can imagine. "All we're trying to do is get these through the winter alive," he says. "In the summer, they really fluff up." That's when DiPatri's hardy banana plant fluffs up, too - and then out and out, till it fills his tiny yard. He loves to sit under it at night and speculate on just how much it grew while he was at work. Kiefer has a hardy banana that's nowhere near the size of DiPatri's. In fact, he was so impressed with his pal's specimen, he posted its photo online in a tropical-plant forum and asked people where they thought it was growing. Puerto Rico? he suggested. Maybe California or Spain or - ha, ha - Philadelphia? "Nobody at all clicked Philadelphia," Kiefer says, "and the people on that board are experts." Contact gardening writer Virginia Smith at 215-854-5720 or vsmith@phillynews.com.